With the arrival of summer, our outdoor spaces will be filled with gorgeous flowers, from dainty meadow flora to big blousy blooms. Can't get to see some amazing displays or can't wait for them to bloom? Well, how about adorning your nails with gorgeous floral designs using Summer Flowers Nail Foil from Charlies Nail Art. I applied the nail foil over a cream base. If you've not tried nail foils before they are easy to use. Apply a special nail foil adhesive over your mani and wait for the glue to become transparent. Then place the foil on top of your nail and gently rub with your finger, hoof stick or cotton bud and in seconds the design is transferred to your nail. Apply top coat to seal and you're done! The Summer Flowers Nail Foil currently cost £0.39 and is sufficient for one full manicure. Available at Charlies Nail Art who has a huge range of nail art items. You can also keep up with all the latest Charlies Nail Art info on Facebook, Twitter, Pinterest, Instagram, Google+ & LinkedIn. 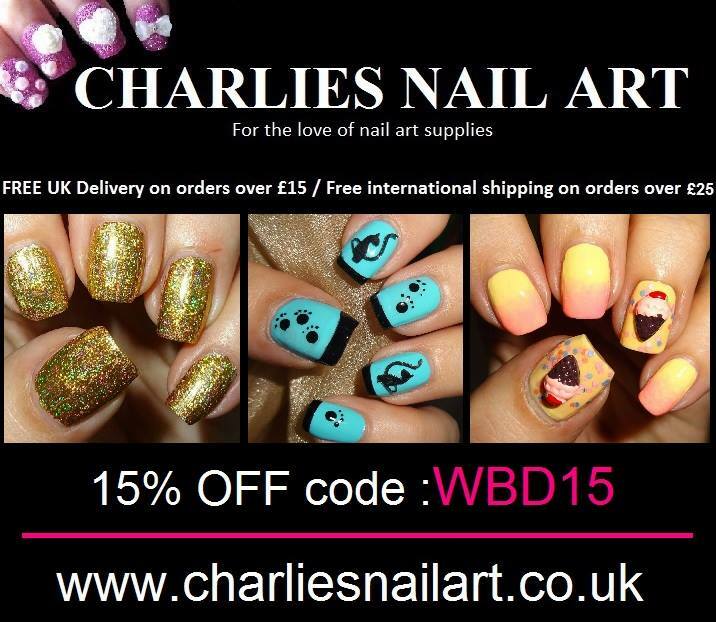 Charlies Nail Art is a UK based company and ships worldwide. UK postage starts from £1.25 and is FREE on UK orders over £15. These are some really pretty decals!